Unfortunately, the HTML specification does not define how to handle invalid markup. (XHTML does, because it uses XML, which goes to great lengths to define how to handle invalid markup. This is one of the best features of XHTML as far as most Web weenies are concerned — it forces pages to be syntactically correct!) Because it is undefined, Web browsers have each had to invent their own way of handling invalid content, while all trying to get the effects that are similar enough that users will think all is fine. 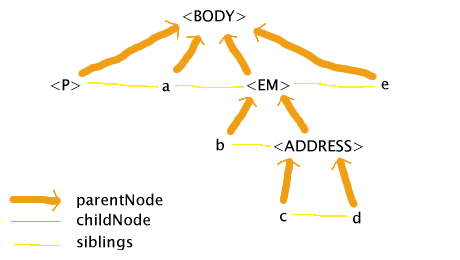 This DOM quite close to what the author wrote — e is indeed a sibling of the ADDRESS element while being a child of the BODY element, and d is indeed a sibling of the EM element while being a child of the ADDRESS element. 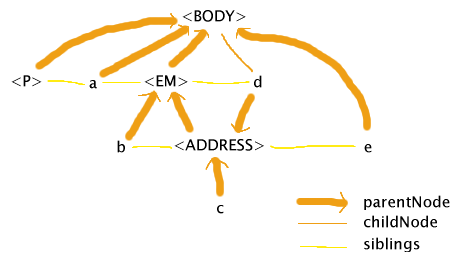 That d is a child of the BODY is, I think, an artifact of IE trying to get the second half of the ADDRESS element to be under the BODY while the first half is under the EM. This DOM is probably showing us a lot more about the internals of Trident (WinIE's layout engine) than was intended. An implementation that internally uses a tree (which is basically what you need to correctly do CSS2) would be hard pressed to come up with a DOM like this. The main feature of this treatement is that it has two EM nodes. 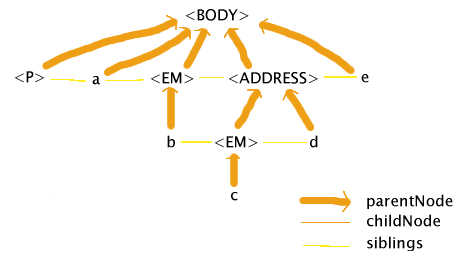 Mozilla reaches the ADDRESS start tag and realises that EM elements cannot contain ADDRESS elements, so it closes the EM and reopens it inside the ADDRESS. Except in certain edge cases (like borders, explicit inheritance, and which selectors match which elements), the result of styling using CSS would be the same as in IE. The advantage of the techniques used by IE and Opera is that it makes it easier to cope with styling and scripting invalid markup. If you use the DOM to dynamically alter the EM element in IE's case, for instance, it'll happily affect the element throughout, around both b and c. In Mozilla's case, an attempt to change the EM element would only affect one of the parts at a time, so for example adding a border around the first EM would not put a border around text node c. Opera achieves the one-to-one mapping of markup to element as well, but doesn't restrict the EM to the text nodes that it contains in the markup. The approaches used by Mozilla and Opera, though, get you a much more stable DOM. This is important for scripting: if you try to walk IE's DOM, you are likely to hit an infinite loop, because walking up the chain of parents for d (namely d → ADDRESS → EM) and then going to the next sibling will bring you straight back to d.
Mozilla's candid nature (what you see in the DOM is exactly what it's going to style) makes interpreting its results a lot easier. Opera's approach (providing a DOM but styling a slightly different model) is a lot more confusing. The net result is that each model has its advantages and disadvantages, and they are about equally matched. And since HTML leaves this undefined, all of them are correct. If you are interested in examining this further, I based this article on the results I obtained using a client side DOM browser I wrote and my legacy HTML parsing test 004 (which is not really a test, since there's no "correct behaviour"). That test also throws styling into the mix (I touched on this above). Amusingly, if you compare Mozilla's behaviour on tests 004 and 005 you find an obscure bug that has nothing to do with the markup being invalid (the colour changes even though the only difference is that 'font-variant' has been changed to 'font-weight').